Internet and Ethernet services are arguably the most important tools for day-to-day business operations. It makes sense then that businesses now place a high priority on getting the fastest speeds they can. 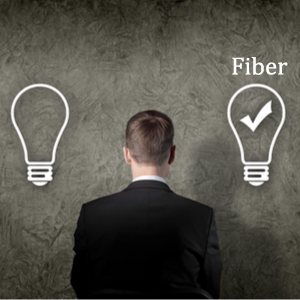 Let’s look at the top 6 reasons businesses are choosing fiber. With 1 to 10 gigabit speeds, fiber is faster than any internet delivered over traditional cables, like copper. Fiber cables are made up of thin strands of glass, with data being transmitted through beams of light. The result? Speed, speed, speed. The faster the connection = the faster work can get done. Ever have to tell coworkers to stay off the internet because you need to download something important? That’s a bandwidth problem. Whether it’s video conferencing, backing up data, or having multiple users on one connection, lots of bandwidth is required. The typical slowdowns don’t happen with fiber. Fiber provides symmetrical bandwidth options and is very scalable. It’s REALLY difficult to put a tap onto a fiber-optic cable for the purpose of capturing data, because it’s glass. Doing so on a copper cable is much easier. If a cable is tapped, it’s easy to see. After all, light will leak from the cable and will cause the entire system to show a failure. Unlike copper cables, fiber is impervious to weather conditions such as temperature, moisture, and lightning. Business don’t have to worry about electrical surges, RF/ radio waves, and other environmental conditions that result in signal loss—which can easily happen with copper. It can also deliver data more reliably over greater distances. More and more businesses (of every size) are shifting toward convenient cloud-based solutions. But, moving data back-and-forth can be really frustrating if it takes too long. With fiber, accessing data on the cloud feels like accessing data that’s already on your computer. There’s no denying cloud-based applications are the future, which means fiber’s going to be playing an important role in ensuring that your business is ready. Fiber is future proof, and the limits are expanding every day. Printers, scanners, tablets, laptops, and more: they all connect to the internet, making it important to have a connection that can handle the load. Imagine a fourth grade basketball team trying to take down LeBron James. They’re not going to stop him from getting to the rim, and, similarly, your team of connected devices isn’t going to slow down your fiber internet.